I went into a parlor to get my hair done several years ago and one of the stylist recommended this perfume to me. I have loved it ever since. 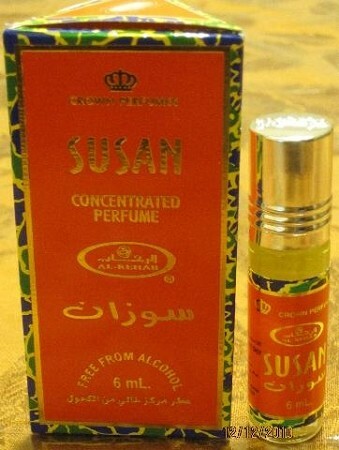 I have never received as many compliments on any perfume as I have on Susan. I like that I can get multiple roll-ons in one package. Absoutely Love It!! I love so many of the Al-Rehab oils and Susan is one of them that gets me a steady stream of compliments! It has a wonderful light floral scent and being that it has no alcohol, the fragrance lasts for hours! You will not be disappointed! Lovely, sweet and feminine, I love layering with amarige by Givenchy. Smells just like it and makes it last longer. I give it 5 stars and al-rashad is the best company, order arrives fast and in fact, never an issue. God bless! Have used it in the past. This was a reorder. Like it very much.